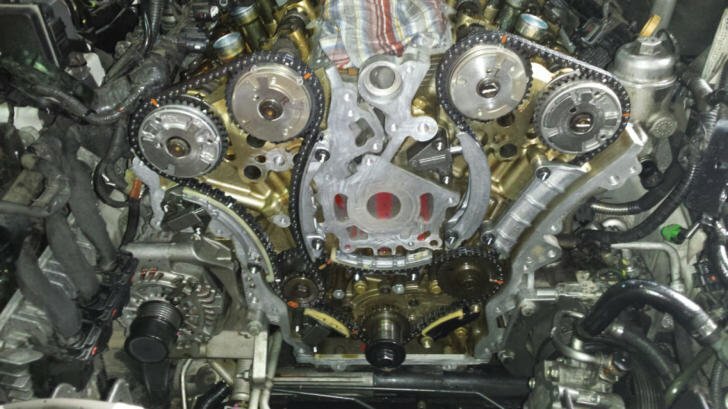 Timing chains are very common on these engines to fail even at relatively low mileage compared to other timing chain engines which can last well over 200,000 km. The average kilometres that we replace timing chains on these engines are around the 100,000 km mark. In saying this we have also serviced these vehicles with well over 100,000km with out any signs of timing chain issues. Another common timing chain noise on the engines are due to tensioners failing. This is a main result of the engine being full of sludge and blocking the oil passages, The best way to maintain and avoid this issue is to carry out regular oil changes, We recommend every 5000km or 3 months. Does your Holden have an engine check light on ? We can diagnose and scan your Holden with our obd scan tool to determine current or pending fault (trouble) codes in the system. Our diagnostic scan tool has the latest available software updates including been able to read live data, OBD fault codes, Actuator and sensor testing and more. UMR Engines has all the specialised timing chain tools and installation procedures on how to install, from camshaft alignment plates, timing chain tensioner locking pins, specialised harmonic balancer pullers, power steering pump puller, key-less crankshaft turning sockets. UMR Engines – Slacks Creek – Brisbane have experienced qualified motor mechanics who can diagnose your timing chain or engine noise faults. UMR Engines only supplies genuine Holden tensioners & Chains when installing the timing kit, with our past experience we have seen faulty new after market tensioners. UMR Engines motor mechanics at 7 Moss Street Slacks specialise in engine repairs, so you know you can trust UMR Engines highly trained Engine Technicians for all your timing & installation requirements. UMR Engines is a recommended RACQ approved repairer. 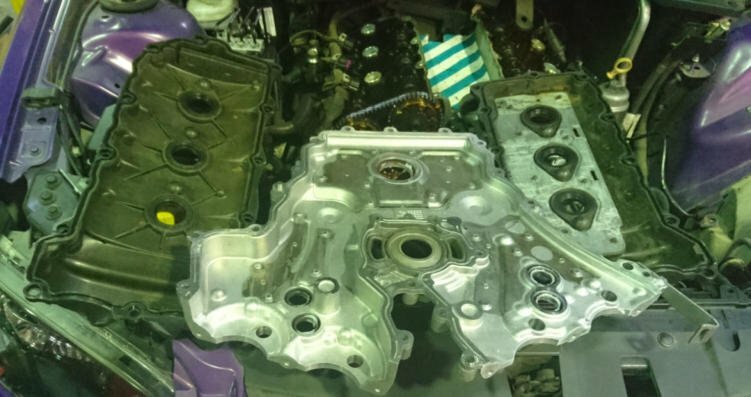 These engines suffer from oil sludge build up in the timing cover and rocker cover areas, Around 1/2 or more that we carry out these repairs on are really sludgy which can result in a premature timing failure. As you can by the picture. We recommend running these vehicles on Premium fuel and to carry out more regular services.The manufacturer recommends to service these vehicle every 15,000km, In our opinion this service schedule is set to reduce servicing cost which in-turn results in better vehicle sales, due to lower service cost. From our hands on experience with these vehicles we recommend that 5000km oil and filter change will slightly increase your engine service costs but will drastically increase the longevity of your engine. Long term your expected lower repair costs will more than compensate for more frequent oil changes. It is not “rocket science”, it is as simple as the fresher you keep the oil in your engine the longer your engine will run without requiring repairs. When we replace your timing chain kit on your Holden, we go one step further. We remove all the sensors from the front of the timing cover, remove the sensor seals & front crankshaft seal, Ultra Sonic clean your rocker covers and timing cover, replace all seals and gaskets. This picture shows the end product of the Ultra sonic cleaned rocker covers and timing cover. We also replace your engine oil and oil filter, radiator coolant at the same time. Once removed we can also inspect other components like your water pump, Belt and radiator cap, to ensure you will have trouble free motoring. We use high end quality parts including genuine timing components. We can determine if your timing chains require replacing. Your engine check light on your Holden can be caused by hundreds of things, some of them are easily fixed and can be inexpensive. We can carry out a system scan and perform a system health check and report any current faults. INCLUDING READ ANY TROUBLE CODES AND PENDING CODES THAT MAY BE IN THE SYSTEM, READ LIVE DATA READINGS, CARRY OUT AN O2 OXYGEN SENSOR TEST. ALSO RUN YOUR VEHICLE ON OUR 4 GAS ANALYSER, TO ENSURE YOUR AIR FUEL RATIOS ARE CORRECT AND WITHIN PERIMETERS. Call us today for a special Internet price to organise your timing chain installation Our timing chain kits includes: timing chain rails, timing chains x 3, timing tensioners x 3, timing tensioner gaskets & oring Including radiator coolant flush, with new radiator coolant supplied.Call us to have your stretched worn out timing chain replaced. Same day fitting service available.